Hi Friends! It‘s Stacy from Mrs. Johnson’s First Grade here to share a little from my collection of back to school “stuff” and a freebie. Yes, this is my classroom. 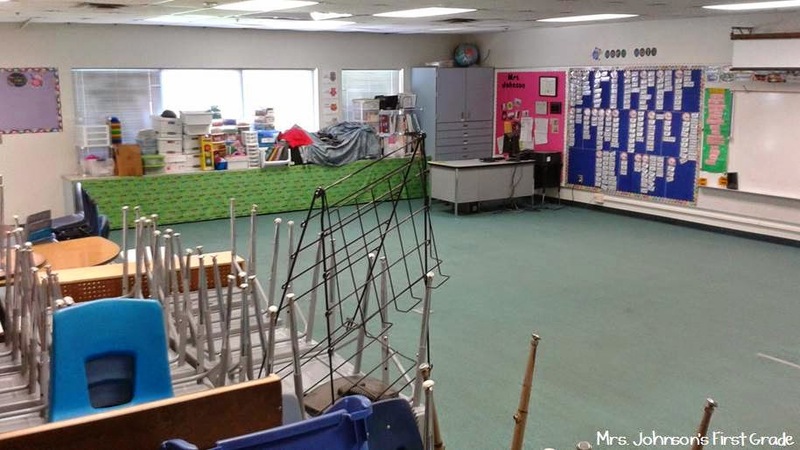 I know it’s not as pretty as some other classrooms I've seen already and I know it is still COMPLETELY empty right now but I’m sure I’ll have it presentable in the 3 days I have left before I take on the role as a new teacher mentor again....YIKES!! One of my biggest tasks besides classroom organization is getting ready for our “Meet and Greet “ the students right before the first day and the open house the week after. One small thing I like to do is send a letter home to parents introducing myself and provide another supply list with pictures to help parents so they can bring the correct items BEFORE the first day. It’s already so hectic the first day, why add everyone’s supplies to the mix! I have labeled baskets for parents and students to put their supplies in so I don’t have a big mess. Plus it makes it easier the first day for the students and it gives me a nice place for the extras. 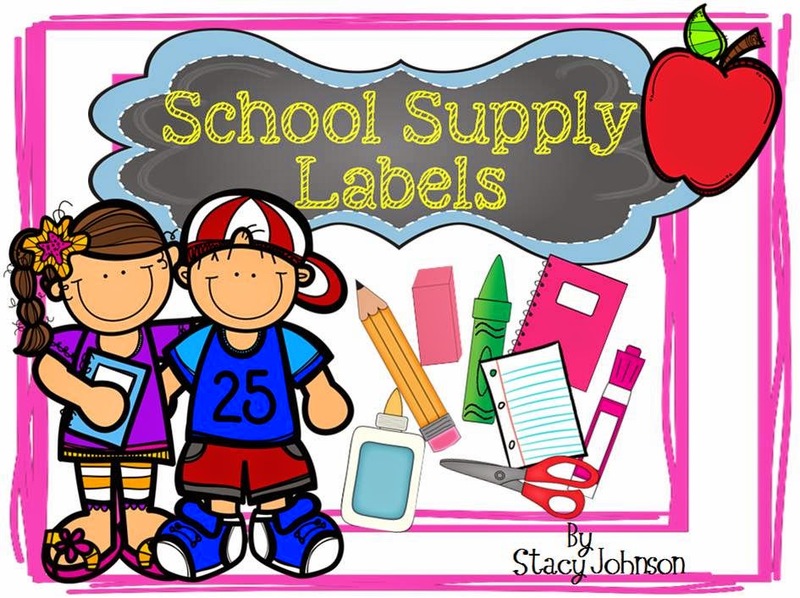 I added the free labels to my store so you can download these by clicking the picture link below. Vendors in the area for help. 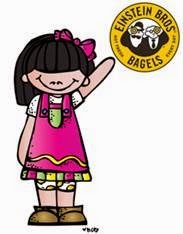 Einsteins has come to the rescue a few times by donating bagels at the end of the day for my Open House night. It’s worth checking it out if you have some stores in your area. I hope you all have a wonderful school year!! I LOVE the idea of including pictures in the list of school supply items. That is genius! I don't know why I've never thought of that but it makes so much sense so the parents know exactly what you want and you don't get random supplies. Great idea. 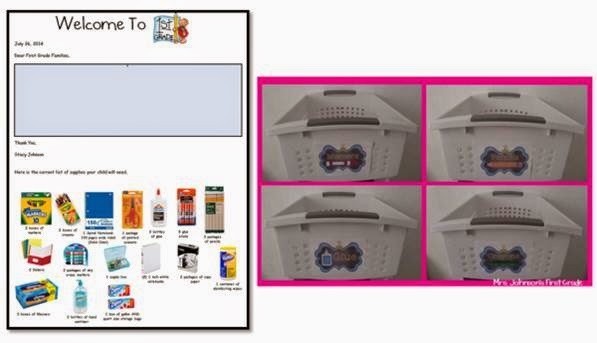 How did you adhere the labels to the baskets? I tried to keep it simple. I laminated them and just taped them to the baskets. You can also use binder rings if you have baskets with holes.